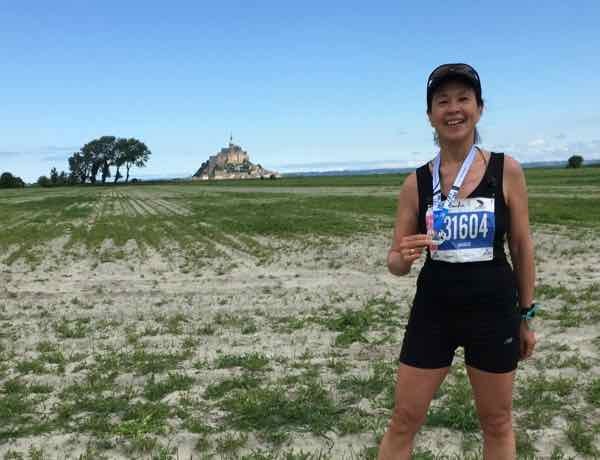 You can take a walking tour, river cruise, or bus tour to see France, but how about another way….by running in France? Let me clarify. I am not suggesting you run AROUND France to see the sites. 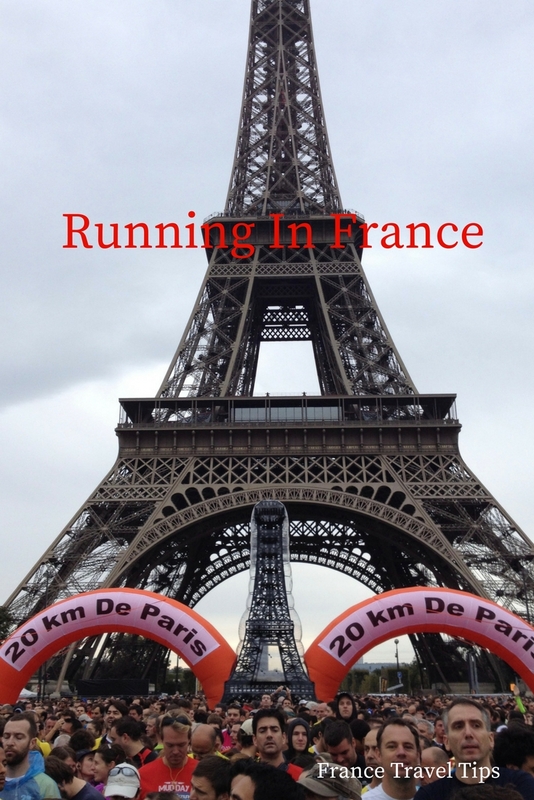 I am suggesting that if you are looking at travelling to France, that you consider adding in a running race in France….5 km, 10km, half-marathon or even a marathon. Before you say, “I can’t even run 1 mile/kilometre”, I should point out that many races have entries for walkers, so it’s not out of the question. Here’s how you can do a race and enjoy your trip. Many French race websites have English sites where you can sign up online. You will be required to submit a doctor’s certificate before the race verifying that you are in good enough health to do the race. The certificate is usually in French; however, it’s fairly easy to translate. I have done many of these races soon after arriving in France from North America. Yes, I had jet lag…there’s a 6 hour time difference so a 9:00 am race is actually 3:00 am EST for me. Don’t let that dissuade you. You’ll be so excited that getting up early (6:30 am—-so 12:30 am) isn’t that bad. Really! I usually take a gravol the night before to make sure I sleep. On September 12, 2017 I got up at 2:00 am in the morning (8:00 am Paris time) to register for this very popular race that doesn’t take place until March 5. 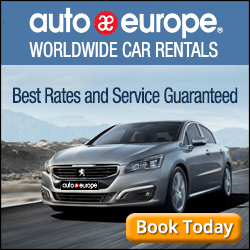 The cost was 49 Euros but after a certain threshold, the price goes up to the next price of 54 Euros. You are required to indicate your expected finishing time as this determines what corral you will be in. They are very strict about when they let the runners into the start area. In this way, however, it is very organized. Your bib has a certain colour on it and designates your entry time. At the race expo, located at the Parc Floral de Paris by Chateau de Vincennes, you need to bring all your identification and papers. There you pick up your bib and t-shirt. There were lots of booths selling clothes and energy and hydration supplements. The day of the semi-marathon on March 5, 2018 was cold (5 degrees celsius) and rainy. Sadly, I did the entire race in the rain. While supposedly 45,000 participants signed up, only 36,510 finished the race. I don’t blame the others for not finishing. It was a tough race. 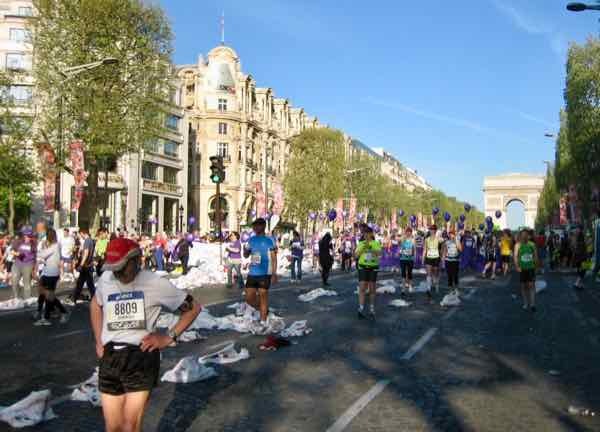 It is also much different from the Paris Marathon as it takes place in the eastern part of Paris. 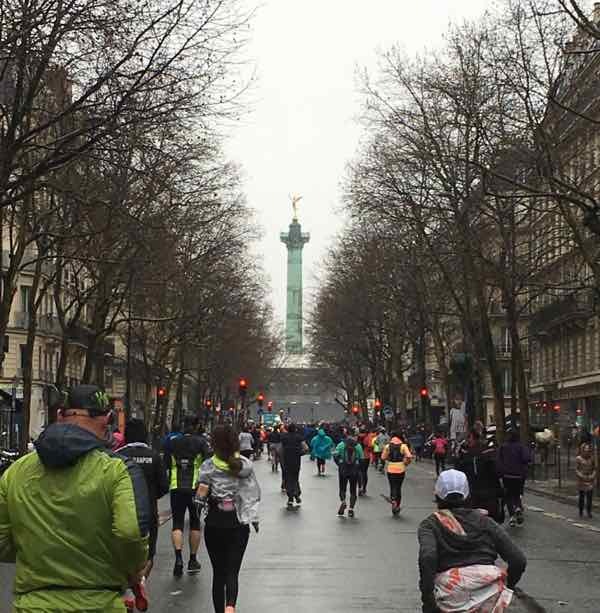 You won’t be seeing the Arc de Triumph or the Louvre, but you will pass by Place de la Bastille and run along the Seine and rue de Rivoli. The Eiffel tower will be in the distance and half of the race will be in Bois de Vincennes, by the Chateau. It’s a very flat race with many, many bands playing (even in the rain) so the support for the runners is excellent. [Registration is in November] The Semi-marathon d’Avranches is a relatively flat race at the end of May that provides lots of opportunities to get photos of Mont Saint-Michel which is the island on which stands the famous 11th century Benedictine abbey . 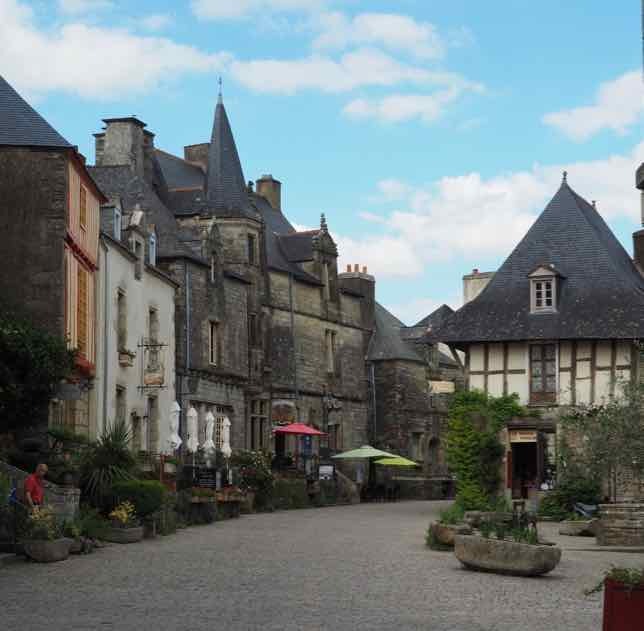 After parking at Mont Saint-Michel you can get a (prepaid) shuttle to the starting point in Avranches located just north-east of Mont Saint-Michel. Sadly, we had to wait 2 hours before the race began; however, the weather was good. There are many different races at the Marathon du Mont Saint-Michel including a full marathon, 10km, 5.5 km, 58.9 km trail, and a Duo Marathon with two runners forming a team. you do not end AT the Abbey, but rather in town near the car park. You’ll still get perfect views of the Abbey in the background, but it will be further away. When you cross the finish line, you’ll get your medal and t-shirt, which is quite common with French races. 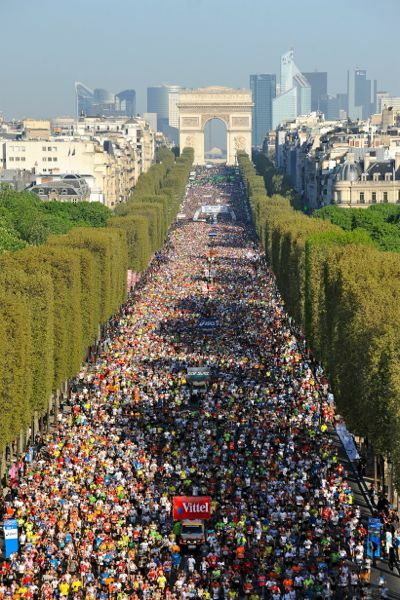 Running in France MUST include doing The Paris Marathon. The race that I ran had approximately 40,000 runners and it is an awesome way to see Paris. You start at the Arc de Triomphe, run down the Champs Elysée, along Rue de Rivoli, and then through many Paris neighbourhoods where the aroma of roasted chickens certainly drove me crazy. My other races in Paris started and finished at the Eiffel Tower and we ran along the Seine for a lot of the race. 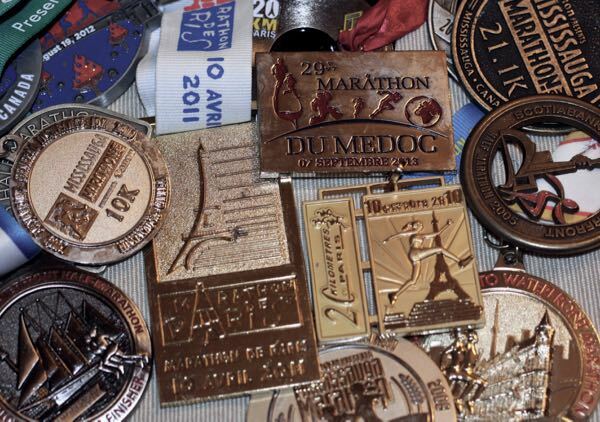 The Marathon du Medoc has you passing through some of the most scenic vineyards in France such as Chateau Lafite Rothschild and Chateau Lynche-Bages. 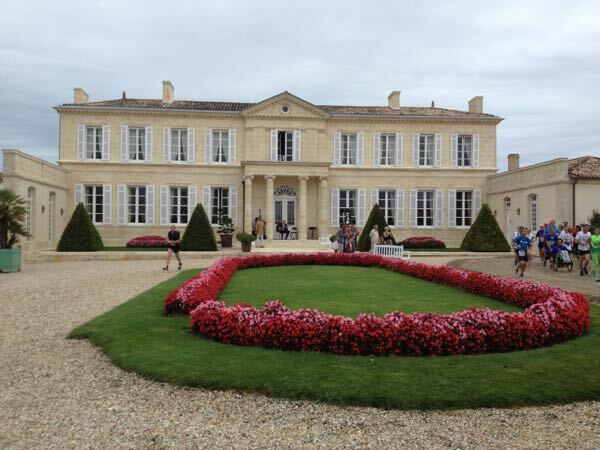 I stayed in Bordeaux and spent a few days touring around there before doing the race in Pauillac. This is the best part about doing a race; you tie in some site-seeing before and after the race. A marathon only takes a few (OK, 3-6) hours so it’s not too much time out of your itinerary. I have done this race three times and it is held in October in the heart of Paris when the weather is perfect: not too hot and not too cold. 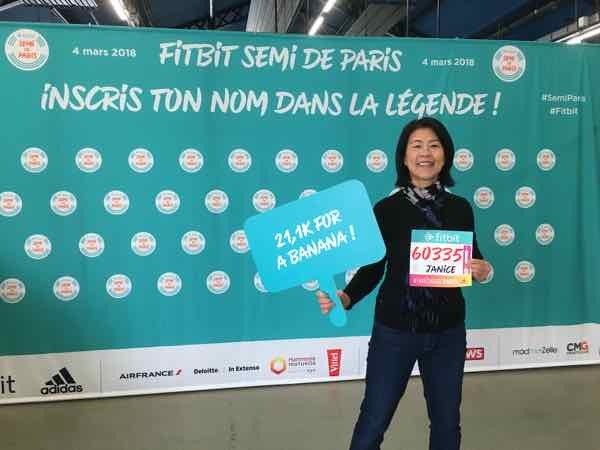 The race starts at the foot of the Eiffel Tower and the route follows along the Seine river and passes the Arc de Triomphe, Place de la Concorde, and through Bois de Boulogne, a lovely forested area. So, if you’d like to sight-see, this is another way to see Paris! For my March break holiday, I really wanted to go to Paris. The bonus was finding a running race nearby. 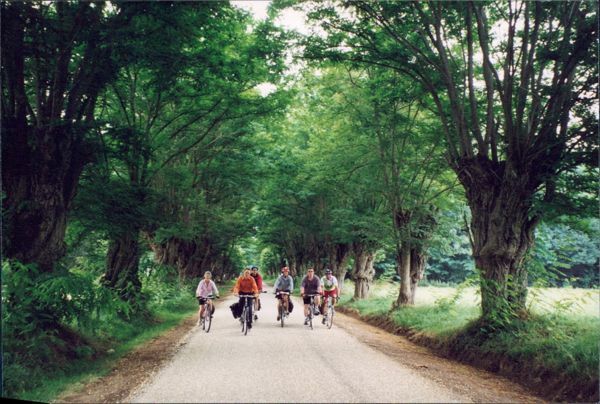 This race was in Rambouillet, a short train ride just outside of Paris. After arriving Paris from an overnight flight from Canada, I took a train to Rambouillet and checked into my hotel. But, no rest for the wicked. I had to get to the race expo to pick up my race bib, so it was an incredibly tiring day (aka jet lag). The next day I got up early (up at 6:00 am was really like getting up at midnight), had breakfast and headed off to the race. It was cold but not freezing. The route took us partly through town and past the famous Chateau de Rambouillet. There was a wooded area that was nice and at the end besides cakes, fruit and granola bars, we were given hot chocolate which was greatly appreciated! Later that day, after having showered and rested, I headed back into town to explore. Sadly the Chateau wasn’t open and I was leaving the next day to head back to Paris, so I really didn’t see much of the town. French races are a bit different from North American races where water stations have cups of water and maybe a sports drink like Gatorade. In France, water is provided along with sugar cubes, raisins, and orange segments. I found it odd (and not environmentally friendly) and rather dangerous that water was not served in cups, but rather bottles. Imagine running over and around hundreds of bottles and hoping you don’t slip on one! 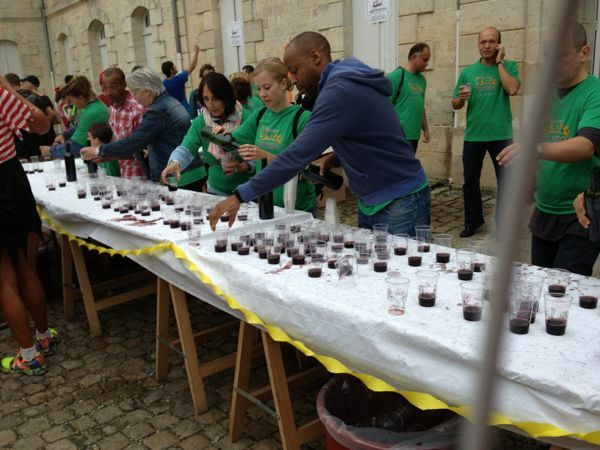 The BEST water stations were during the Marathon du Medoc in Bordeaux wine country where each water station had wine and foods such as chips, granola bars, beef, paté, oysters, and ice cream. I did not get drunk as my strategy was to sip a little wine, sip a little water and eat. I crossed the finish line without collapsing. 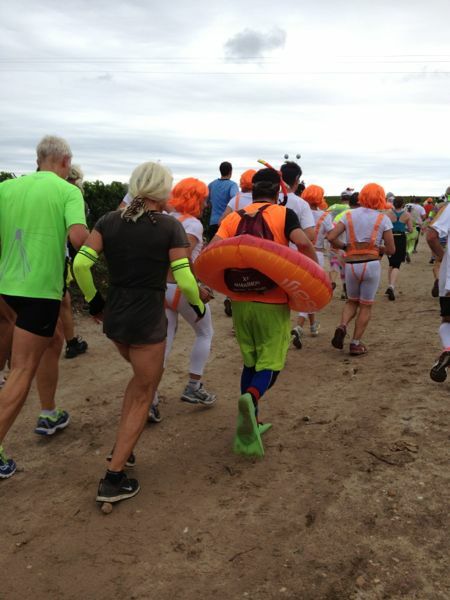 The Marathon du Medoc is not a race where participants hope to get their best time. It’s a party and many are dressed in costumes and the year I ran it, the theme was science fiction. 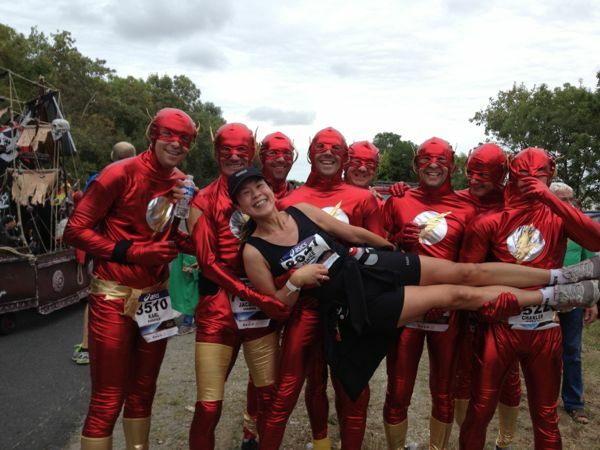 My favourite picture shows a team of Flash Gordon racers holding me up…this was at the oyster water station. It’s a very supportive race where a number of times runners would not only say, “Allez! Allez!” (“Go! Go!) but would also gently guide my elbow along. Hmmm, did I look that tired? Crossing the finish line and getting a finisher’s medal is one of the best parts of running a race. In North America there’s usually sports drinks, bananas, and bagels to eat. In France, I’ve been given: pound cake, prunes, granola bars, cookies, and muffins, but the BEST swag was at the Marathon du Medoc. 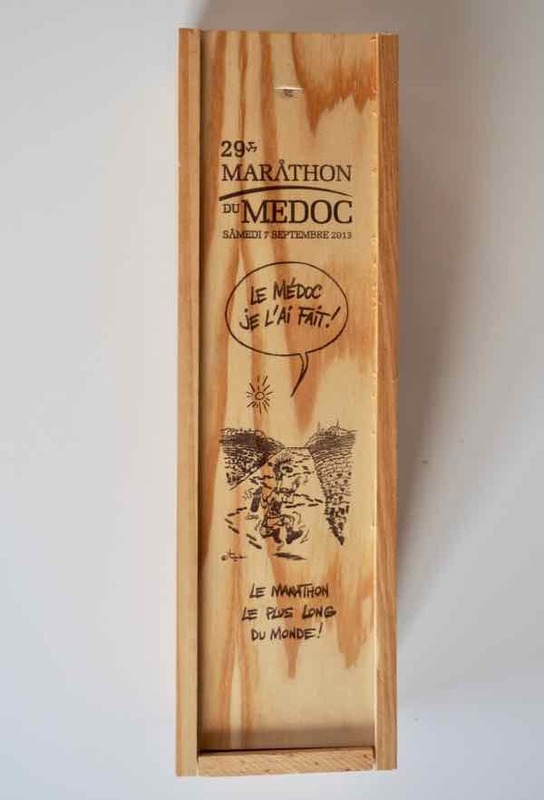 Each finisher received a knapsac containing a box with a bottle of Bordeaux wine, a tasting cup to drink more wine (or beer) at the finisher’s beer tent. Told you it was a party! 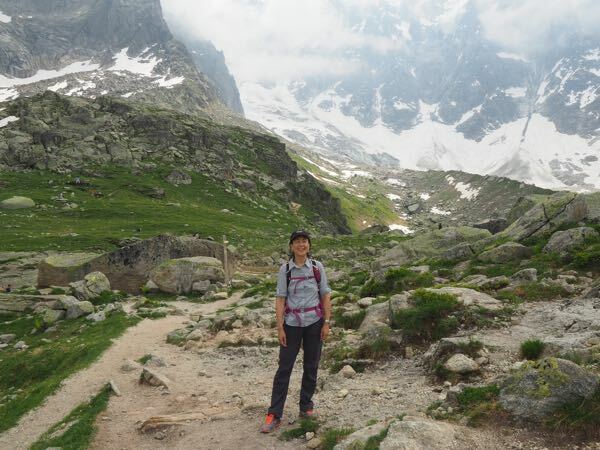 If you want to have a memorable experience travelling, seriously consider running in France and doing a race. 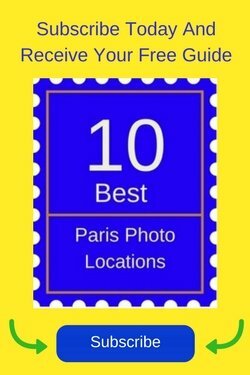 You’ll have not only have a great achievement but you will also have seen France in a slightly different way. 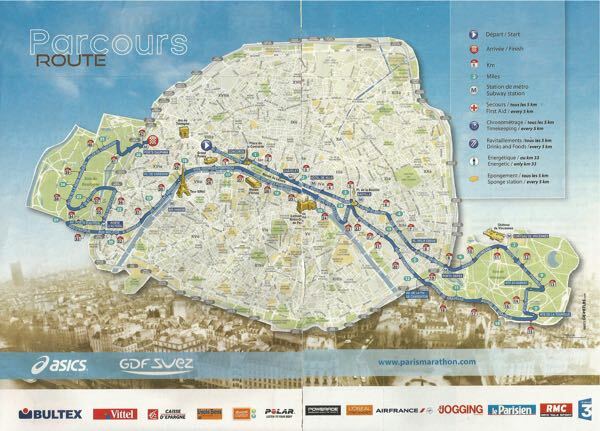 And if you can’t fathom a race, consider doing a Paris Running Tours tour. You’ll not only get a tough or easy workout (your choice), but you’ll learn all about the history in Paris in a very interesting way. 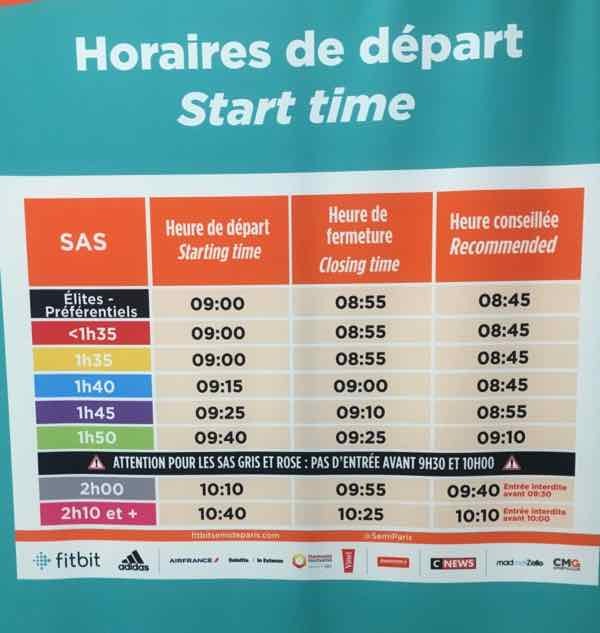 If you don’t want to do a running race in France, but you are travelling to Paris, I highly suggest either running before 8:30 am or running in a park. The reason is that the traffic starts to get heavy and unfortunately you will inevitably have to cross some streets that have lights. So, you will be stopping and starting constantly. You can run along the banks of the Seine as there are footpaths; however, once again you will hit a street and have to cross. An alternative is to run in Luxembourg gardens. You’ll find lots of joggers and it has a path around the perimeter; however its only about 2 kilometers (1.3 miles). Jardin des Plantes is another one but the perimeter is even smaller. Parc des Buttes Chaumont is lovely but a bit out of the way. I have run up and down the Champs Elysee as well. Just do it before the crowds come out! So where have you run during your travels? What races have you done in France? Not seen Paris in a long time but I know I will see this amazing city in the not too distant future. I really admire all the runners. Great post! Thank you! One of the best parts: crossing the finish line! Love the idea of running as a tourist. I did this in San Fran last year running up and down the rolling hills on the way to the waterfront from downtown hotel. I did it when I landed so I’d be tired at bedtime west coast time. I got to the pier faster than by public transportation and running towards the bay provided me with a gorgeous view I had not enjoyed in the 15 years I have been traveling to the area. I also hate walking, you get more ground covered when running. Thanx for the article Jan! Thanks for sharing your experience. So true about beating public transportation. And good for you for doing those hills. I hear the San Francisco marathon is a killer! 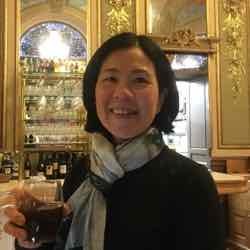 I’m not a runner myself, but travelled with a friend who ran everywhere when we visited Italy, including Venice where she almost ran into a canal – literally! It’s certainly a unique way to see a place and would give you an entirely different way to evaluate destinations! Kudos to you, and keep on running! OMG! Into a canal! Well I guess that’s another way to see Venice! Thank you for your support and comment. Marathon water stations with wine and snacks? Wow, France sounds like a dream destination for runners. This is an inspiring blog post for many of us travellers who pack on the pounds when travelling. I’m especially impressed with all your medals! Many thanks. Yes, I run so I can eat (almost) whatever I want. I love those French patisseries! Wow! That is a LOT of people lining up to start the run/walk the race. I’m not a runner but I’d walk, but I think I’d walk the route on another day to escape the crowds. 😉 We love France. We spent 3 weeks in Paris and this past May we spent 10 days in Aix en Provence and I fell in love with the region. Would love to return for an extended stay. I was in Provence then too, but never made it back to Aix. Was great weather then, wasn’t it?! I’m not a runner anymore but might have to rethink that. Wine and pate at the water stations. I just adore France. Great write up Jan! Thank you! The food and wine alone make the race worth it! I like the way events like this provide instant camaraderie–and inspiration for travel. Everyone was so friendly in the race. Was so surprised when the Flash Gordon guys picked me up! This is awesome! What a unique and interesting way to experience one of the greatest places in the world! 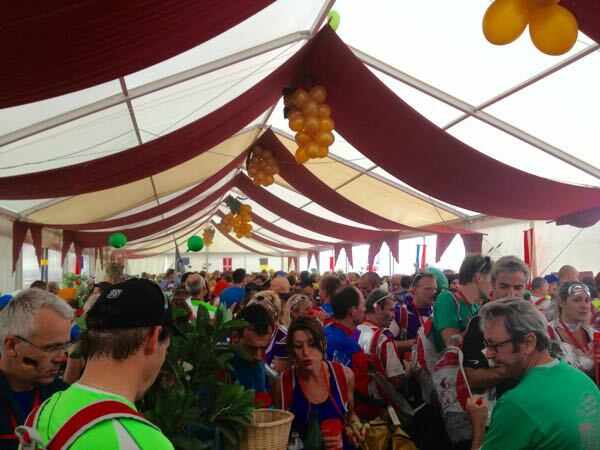 The wine just kept flowing…even after the race in the beer/wine tent. Is definitely a race to try! I am very excited. I am running my first French race. 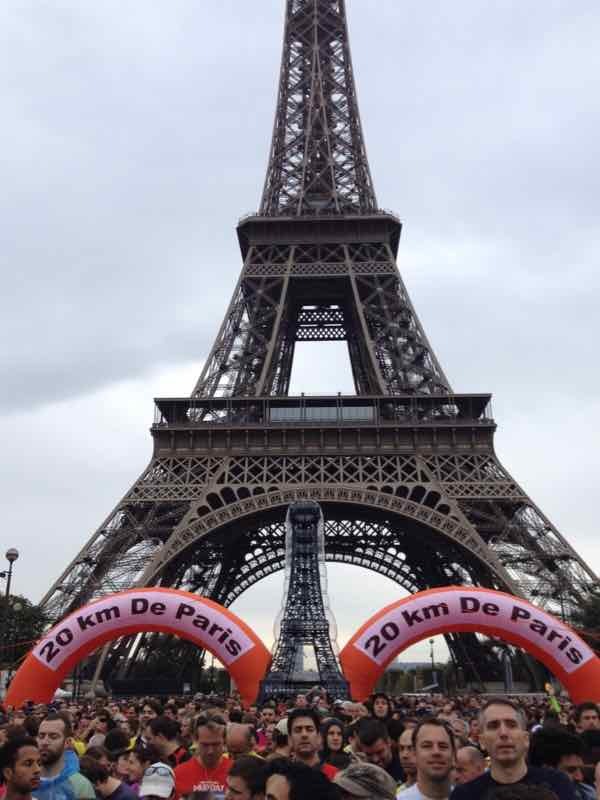 Les 20km de Paris!!! That’s great! You’ll love it. I’m doing it again too! As for advice? The only advice I would add to what I wrote in this post is that there are spots where you are running on cobblestones so just have to be a little careful, especially if they’re wet. It’s a great first race to try and the crowds are wonderful yelling, “Bon courage!” (Literally meaning ‘be brave’ but more like ‘good luck’). You’ll love the experience. Have a wonderful time! Who knows, we might meet up at the start line!